Enjoying the final season of HBO's Game of Thrones? This is the time to start a tabletop fantasy roleplaying campaign set in Westeros using A Song of Ice and Fire Roleplaying, the official RPG from Green Ronin Publishing based on the bestselling fantasy epic A Song of Ice and Fire by George RR Martin that inspired the Game of Thrones series. Designed by Robert J. Schwalb (Shadow of the Demon Lord), SIFRP focuses not just on characters but on noble houses that wage war and stage intrigues in the great game where you win or you die. This Song of Ice and Fire Bundle brings you almost the entire SIFRP line for a bargain price. For just US$14.95 you get all five titles in our Starter Collection (retail value $72) as DRM-free .PDF ebooks, including the complete A Song of Ice and Fire Roleplaying core rulebook in both its Game of Thrones Edition (retail price $20) and its Pocket Edition optimized for tablet use (retail $14), as well as the Campaign Guide (retail $20) and Chronicle Starter (retail $13) and the introductory adventure Wedding Knight (retail $5). And if you pay more than the threshold price of $27.10, you'll level up and also get our entire Bonus Collection with eight more supplements and adventures worth an additional $70, including the Night's Watch sourcebook (retail $18); the full-length chronicle Dragon's Hoard (retail $19); three Chronicle System rules supplements -- Out of Strife, Prosperity (new Holdings), Spark to Powder (gunpowder rules), and Chronicle of Sorcery -- and three creature guides: Woodland Creatures, Mountain Terrors, and Desert Threats. 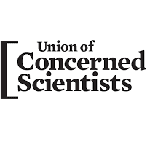 Ten percent of your payment (after payment gateway fees) will be donated to the charity designated by Chris Pramas of Green Ronin Publishing, the Union of Concerned Scientsts. ...But you pay just $14.95 for our Starter Collection of five complete .PDFs, including the SIFRP core rulebook in its Game of Thrones and Pocket Editions, the Campaign Guide and Chronicle Starter, and Wedding Knight. And if you pay more than the current threshold price ($27.10), you'll level up and also receive all eight titles in our Bonus Collection, including the Night's Watch sourcebook, the Dragon's Hoard campaign, and six mini-supplements for the Chronicle System rules that power SIFRP. Bundle of Holding titles are always absolutely free of DRM, so you can move and copy them freely among all your tablets, laptops, and smartphones. To keep the starting threshold price from rising too quickly, we calculated it based on 400 fake sales at $24.95 each. 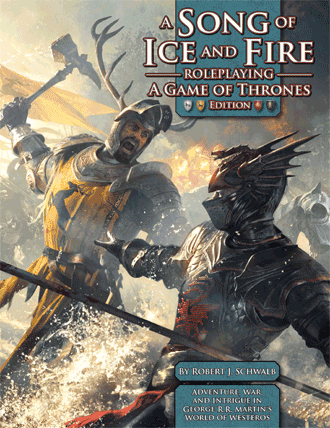 The tabletop roleplaying ebooks in this Song of Ice and Fire Bundle offer retail for US$142. Choose a price you like, in US dollars (minimum $14.95). Make sure you choose an amount greater than $27.10 to LEVEL UP and gain the bonus titles. Just a note: This amount is below the threshold price, so you're receiving only the starter collection. To LEVEL UP and get the BONUS collection, please choose an amount more than $27.10. You're ordering the Song of Ice and Fire Bundle with the account . Right? × It looks like you've already purchased this Song of Ice and Fire Bundle offer with your account address . Thanks! Please log in and visit your Wizard's Cabinet to download your files. Then visit your Wizard's Cabinet page, link up with your DriveThru library, and start playing the great game where you win or die. A Song of Ice and Fire Roleplaying, based on the best-selling fantasy series by George RR Martin, is a sweeping epic of war and the struggle for political power and survival in the Seven Kingdoms of Westeros. SIFRP is about Machiavellian court politics, family alliances and enmities, the rise and fall of kingdoms, and the clash of armies, but it is also about honor and duty, family, the responsibilities of leadership, love and loss -- about tournaments, murders, conspiracies, prophecies, dreams, war, great victories, and terrible defeats. It's about knights, both false and true -- and it's about dragons. This deluxe Game of Thrones Edition (retail price $20) has new illustrations, a short introductory adventure, and the full-length scenario Peril at King's Landing, originally published separately. The included Pocket Edition (retail $14) is optimized for tablet viewing. Includes the Free Start quickstart rules. A Song of Ice and Fire Roleplaying - A Game of Thrones Edition copyright © 2012 Green Ronin Publishing, LLC. All rights reserved. "A Song of Ice and Fire Roleplaying," "SIFRP," and associated logos are trademarks of Green Ronin Publishing, LLC. A Song of Ice and Fire copyright © 1996-2019 George R. R. Martin. All rights reserved. With the fall of House Targaryen, an uneasy peace has settled over the land, but it stands on a razor's edge. King Robert rules, but his reign is haunted by the dark deeds of the past and imperiled by corruption in the halls of power. A Song of Ice and Fire Campaign Guide describes the Seven Kingdoms of Westeros as of the start of the novels, with full descriptions of all the major regions and principal players of the game of thrones. 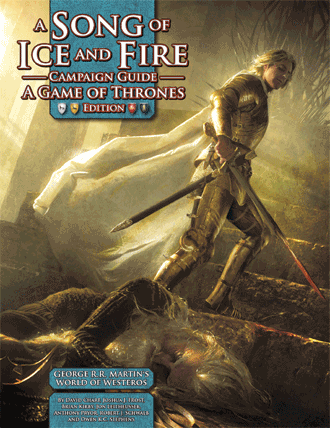 An indispensable guide for fans of both the novels and the game, the Campaign Guide brings the Seven Kingdoms to life and provides a rich setting for exciting roleplaying adventures. This Game of Thrones Edition revises and updates the original book. Contributors to the Song of Ice and Fire Roleplaying Campaign Guide include DaviD Chart, Joshua J. Frost, Brian E. Kirby, Jon Leitheusser, Anthony Pryor, Robert J. Schwalb, and Owen K.C. Stephens. A Song of Ice and Fire Roleplaying Campaign Guide copyright © 2012 Green Ronin Publishing, LLC. All rights reserved. "A Song of Ice and Fire Roleplaying," "SIFRP," and associated logos are trademarks of Green Ronin Publishing, LLC. A Song of Ice and Fire copyright © 1996-2019 George R. R. Martin. All rights reserved. To get the full experience of A Song of Ice and Fire Roleplaying, play a chronicle that lets you engage in the game of thrones. 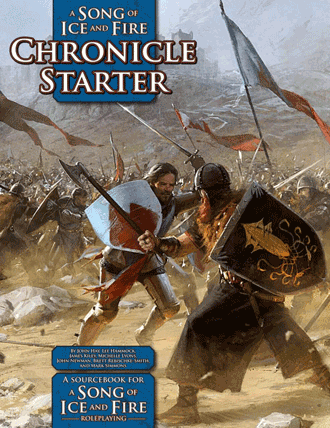 The Chronicle Starter sourcebook details six sample houses, any of which can be run by the player characters. Choose your house and allegiance (Arryn, Baratheon, Frey, Lannister, Stark, or Tully), or make up your own Home House and make allies or enemies of those provided. The Chronicle Starter also includes a complete three-act scenario, "The Iron Plot." Contributors to A Song of Ice and Fire Roleplaying Chronicle Starter include John Hay, Lee Hammock, James Kiley, Michelle Lyons, John Newman, Brett Rebischke-Smith, and Mark Simmons. A Song of Ice and Fire Roleplaying Chronicle Starter copyright © 2011 Green Ronin Publishing, LLC. All rights reserved. "A Song of Ice and Fire Roleplaying," "SIFRP," and associated logos are trademarks of Green Ronin Publishing, LLC. A Song of Ice and Fire copyright © 1996-2019 George R. R. Martin. All rights reserved. The saga of Westeros is a story of alliances and betrayals, love and hate, and the rise and fall of great dynasties. A central element is marriage, as both a tool of the great players of the game, and a romantic ideal for the young at heart. 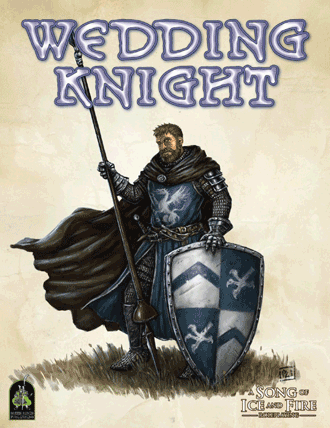 Wedding Knight is an introductory tale for A Song of Ice and Fire Roleplaying built around one such marriage, with both practical value for the families it proposes to unite, and romantic potential -- and dangers -- for the bride and groom, who may well be characters in your series. Wedding Knight copyright © 2009 Green Ronin Publishing, LLC. All rights reserved. "A Song of Ice and Fire Roleplaying," "SIFRP," and associated logos are trademarks of Green Ronin Publishing, LLC. A Song of Ice and Fire copyright © 1996-2019 George R. R. Martin. All rights reserved. Though the Great Houses and their vassals play the eternal game of thrones, some do not. The men of the Night's Watch guard the immense and icy Wall, built in the ancient days of Westeros to hold back the terrible things of the Long Night. Once a mighty cohort of brave knights and lords who gave up everything to protect the Seven Kingdoms from the predators of the Far North, the Night's Watch is now a ragtag band of thieves, murderers, and exiles who ran afoul of their enemies. When the wildlings stir on the other side of the Wall, and the cold winds rise once more, will they be enough to save Westeros? 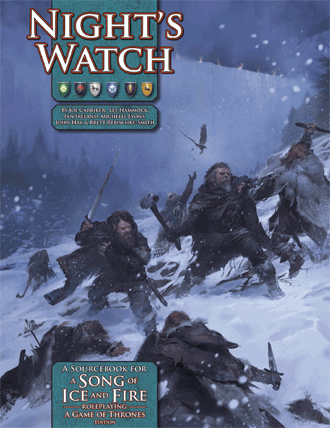 Night's Watch gives you everything you need to add this once-noble order to your Song of Ice and Fire Roleplaying chronicle. It includes rules for playing men of the Night's Watch and wildlings alike, as well as new information about the mysterious Others. Contributors to Night's Watch include Lee Hammock, John Hay, Ian Ireland, and Brett Rebischke-Smith. Night's Watch copyright © 2012 Green Ronin Publishing, LLC. All rights reserved. "A Song of Ice and Fire Roleplaying," "SIFRP," and associated logos are trademarks of Green Ronin Publishing, LLC. A Song of Ice and Fire copyright © 1996-2019 George R. R. Martin. All rights reserved. Ned was aghast. "Aerys Targaryen left a treasury flowing with gold. How could you let this happen?" Even years after the fall of House Targaryen, their legacy is not forgotten. When a band of ruffians bound for the Wall seek shelter for the night, one of them reveals a secret that sparks a quest across Westeros and even the Narrow Sea to Braavos, in search of untold riches: the massive treasury left behind by the Mad King Aerys Targaryen, spirited away in the final days of Robert's Rebellion! But our heroes are not the only ones seeking the lost dragon's hoard, and their rivals will stop at nothing to claim it for themselves. Will it be riches in the end --or ruin? 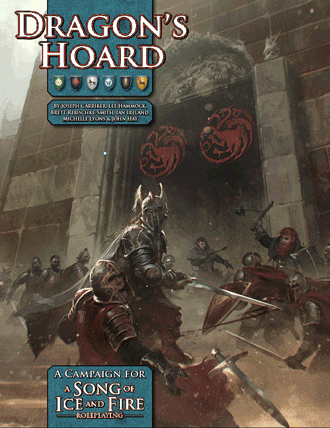 Dragon's Hoard is an epic chronicle for A Song of Ice and Fire Roleplaying that can provide months of gameplay. Contributors to Dragon's Hoard include Lee Hammock, Ian Ireland, Scott Holden, Neall Raemonn Price, and Lauren Roy. Dragon's Hoard copyright © 2016 Green Ronin Publishing, LLC. All rights reserved. "A Song of Ice and Fire Roleplaying," "SIFRP," and associated logos are trademarks of Green Ronin Publishing, LLC. A Song of Ice and Fire copyright © 1996-2016 George R. R. Martin. All rights reserved. These three general rules supplements expand the Chronicle System in new directions independent of the Song of Ice and Fire setting and storyline. Out of Strife, Prosperity by Jeb Boyt and Lee Hammock (35pp, retail price $6): Whether a peaceful agrarian House known for grain and fine warhorses, or a sinister House notorious for extravagant wealth and staff assassins, noble Houses are defined by the their Wealth Holdings. With more than 60 new and updated Wealth Holdings, Out of Strife, Prosperity expands the roles of the Houses in your chronicle. 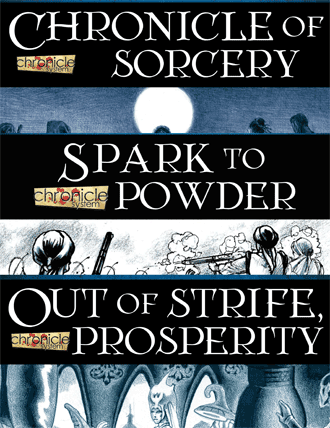 Spark to Powder by Jack Geiger and John C. Hay (37pp, retail $5): Spark to Powder pushes the Chronicle System into the Gunpowder Age with equipment and Benefits that reflect the advent of black powder: new weapons and Warfare Units, new Qualities for those skilled in firearms, and Drawbacks for those who run afoul of them. Changes to Wealth Holdings reflect new opportunities for wealth and power, as well as a pressing need to install this book's new Defensive Holdings. Chronicle of Sorcery by Joseph Carriker (48pp, retail $5): When darkest sorcery and the mysteries of magic are laid bare, such power will shake the lands themselves. This supplement details the core mechanics for magical power in any Chronicle System game, including basic Sorcery mechanics, new Benefits and Drawbacks, Common Sorceries, and new Holdings for Houses with magic at their disposal. Out of Strife, Prosperity and Chronicle of Sorcery copyright © 2014 and Spark to Powder copyright © 2016 Green Ronin Publishing, LLC. All rights reserved. "Chronicle System," "Green Ronin," and their respective logos are trademarks of Green Ronin Publishing, LLC. 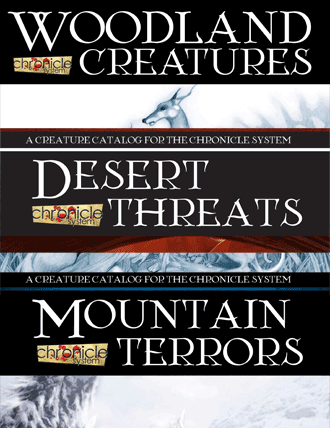 These three bestiaries work with any Chronicle System game, not just those set in Westeros. Desert Threats (38pp, retail $6): In forbidding wastes live the voracious djinn-hound, the golden kraken, and many other bloodthirsty beasts. Mountain Terrors (41pp, retail $6): In the highest mountains peaks dwell the bestial alpingast, the cloud leopard, the devouring shadow, and the deadly skullcracker. Explore the dangers of the alpine reaches. Woodland Creatures (34pp, retail price $5): In the tangled darkness of the woodlands you may encounter ravenous super-predators, strange creatures hinted at in folklore, or unholy terrors of supernatural provenance. Woodland Creatures copyright © 2013, Mountain Terrors copyright © 2016, and Desert Threats copyright © 2018 Green Ronin Publishing, LLC. All rights reserved. "Chronicle System," "Green Ronin," and their respective logos are trademarks of Green Ronin Publishing, LLC.